The Glenmorangie Lasanta, Gaelic for ‘warmth and passion’, is extra matured in sherry casks. The new design reflects the whisky’s intensity through its fiery colour palette and Andalusian inspired detailing. The branding has been amplified and the characteristics of the expression put into a clearer hierarchy. In the 2014 Whisky bible, Jim Murray described the Glenmorangie Quinta Ruban whisky as ‘complexity...portrayed with clarity and confidence’, which also goes a long way in describing the new packaging design. This dark and powerful whisky’s packaging now has a black satin finish and proudly wears a Porto styled QR monogram. Glenmorangie Nectar D’Or is extra matured in high value ex ‘Sauternes’ barriques, the most famous sweet-wine-growing region in France. The liquid has a silky smooth, warm honeyed, rich taste profile epitomised by its name. The soft touch rigid board construct immediately signifies both the status and silkiness of the liquid. The Nectar D’Or logo takes you to vintage France, the gold foiling reflects the rich nectar flavours and liquid colours and the Sauternes typography is reminiscent of the wine labels of this region. This is all balanced with Glenmorangie’s brand codes and its modern and contemporary style. “Nectar D’Or is a stunning liquid and demanded packaging that respected its credentials. Its rich product story, silky smooth finish, golden colour and honey flavours needed to be brought to life through the packaging, this was not just a graphic redesign but a sensory expression of the flavour experience,” says Jon Davies, Creative Director, ButterflyCannon. The main rationale behind the redesign of the extra matured range was to reflect the fact that each of the Glenmorangie extra matured expressions has it’s own distinct personalities, says Chris Joscelyne, creative account director, Butterfly Cannon. “As such, whilst the packaging design of each expression has certain consistent features such as the finessed branding hierarchy which emphasises that the extra matured range is a family of products, each expression has subtle variations within the design, such as bespoke footer label designs and their own logotypes. 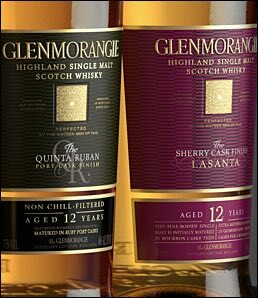 “In order to communicate the extra level of craft and attention to detail that has gone into the extra matured range, both the label and secondary packaging of Lasanta and Quinta Ruban have been changed from a glossy to a subtler satin finish, which allows foiled elements such as the Glenmorangie logo and signet added stand out.